Students must give at least 48 hours notice by SMS if wanting to cancel or re-schedule a lesson. This is sufficient time to reallocate your lesson time. If 48 hours notice is not received the full lesson fee will be charged. For those requiring non-ongoing session/s - for example, to prepare for an audition - a casual fee will apply. Lessons will be invoiced in advance and must be paid for at the time they are booked, so as to ensure a commitment to preparing for and attending the session. When taking on new students for individual training/coaching, voice students are required to firstly attend one or two sessions with Beth Atkins (speech pathologist and Estill Voice Training (TM) Certified Master Teacher), or with a similar specialist. They will reinforce an understanding of vocal health, particularly from the standpoint of a speech and voice therapist, and give the student a screening for any risk factors. On enrolling in the studio, we look closely at what types of physical activity new voice students are participating in, to ensure a level of commitment to the bodywork required to support good speech and singing technique. Students will be encouraged to take up recommended activities, if they aren’t already participating in them. These conditions are in place so that we can focus on musical and vocal training, rather than on correcting poor physical habits, and to build up the general level of awareness around vocal and physical health for singers and actors. Studio concerts are held each year, at which all students perform. These concerts are in the form of an open class, and are very important for all students - at every level. These concerts are now open to the general public. We do not subscribe to the concepts of 'talents' and 'gifts' in our practice. We do not allow mobile phones in rehearsals or workshops with young people, and have strict rules around the use of social media when working with children and young people. Mobile phones are allowed in private lessons for recording purposes. We do not use food rewards. Soft drinks, energy drinks, lollies, chips and other junk foods are prohibited from rehearsals, workshops and performances. We encourage healthy food, plenty of water, plenty of sleep, and good-old-common-sense e.g. wearing warm clothes in winter, with good protection for chest, throat, ears and back. All students are taught about nose breathing for general health, alongside breath awareness for when singing/speaking on stage. Students with dysfunctional breathing or poor breathing habits are encouraged to undertake Buteyko breathing training. Realistic goals are set for each student, and feedback focusses on specifics. Our work practices are designed to fully support the student's emotional and psychological wellbeing, and to build resilience, self awareness and individual responsibility in the approach to their art practice. Prospective students who present with vocal problems or physical issues that require specialist support will be asked to seek treatment from appropriate therapeutic practitioners (via their GP) and will need to supply written evidence of the successful completion of this treatment before being able to commence training with WVMT. Staff working with young people have police clearance and have undertaken specialist training in working with young people. Environmental awareness and sustainability is integral to our work practices. Healthy and sustainable work practices also inform our work with adult professional artists. WVMT regularly reviews their policies regarding working with young and vulnerable people. Wild Voices Music Theatre director, Dianna Nixon, has 40 years of practical experience as a multi-disciplinary performer and educator. Her training has included a degree in music from the Victorian College of the Arts, as well as Estill Voice Training Levels 1 & 2, A.Mus.A (piano), A.Dip. 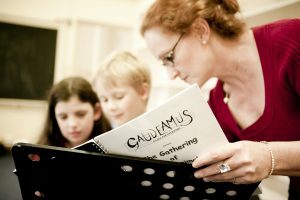 A (drama and music), Cert IV (Workplace Assessment & Training) and many short courses in early childhood music education, piano pedagogy, choral direction, drama and languages. Dianna has completed a Youth Mental Health First Aid Certificate, First Aid Certificate, Buteyko training, and a range of training related to wellbeing. 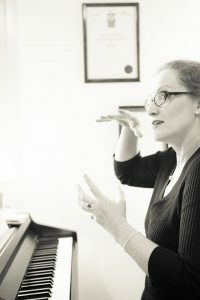 Many years of voice and dance training and ongoing research across these related areas have contributed to her methodology in teaching piano, voice and drama. Her Churchill Fellowship research focussed on The Developing Voice. Dianna, along with any other practitioners engaged by WVMT, is fully committed to lifelong learning, maintaining a rigorous personal training and development program. Dianna continues to perform professionally as musician, actor, singer, and undertakes work as project director and producer. Dianna has conducted intensive voice and performance workshops for professional companies and for community choirs and school groups and has been employed in the education programs of various opera companies. 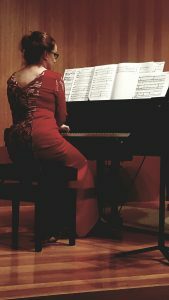 Dianna has extensive professional experience as an accompanist in a wide range of repertoire - covering classical and contemporary repertoire, with a special focus on vocal and choral work, and is a specialist accompanist for ballet.